Being a glacier archaeologist must be one of the best jobs in the world! The finds can be spectacular, the scenery is wonderful and you get that good old expedition feeling, which is hard to come by in regular archaeology. Fieldwork normally takes place during a short time window from mid-August to mid-September each year. We do not want to start too early, since much of the snow from the previous winter would still be left, covering the old ice. This would lessen the chances of discovering artefacts. Starting too late is also hazardous. We might get early winter snow, and the field season could be over before we got started. 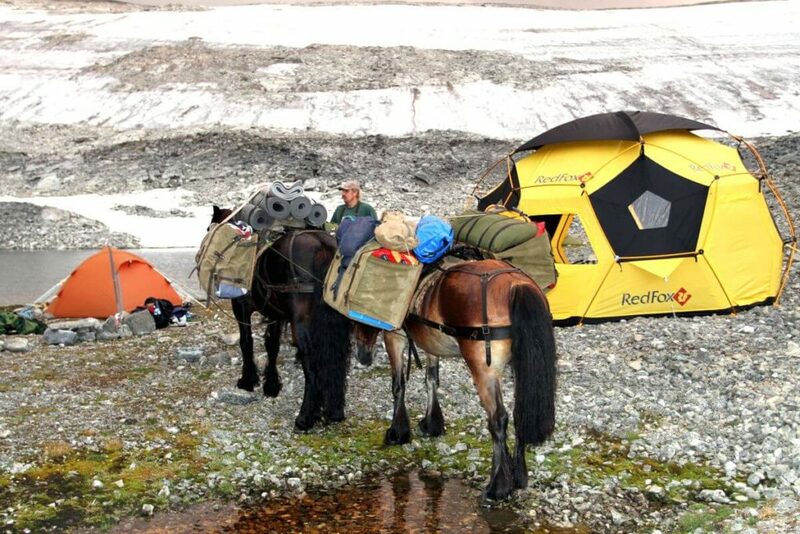 Jakop Brennhaug and his packhorses in the Lendbreen basecamp. Photo: Oppland County Council. Getting to the sites can be quite hard, including substantial uphill hikes with heavy backpacks, so being in good shape is a precondition for participating in the fieldwork. We try to use packhorses whenever possible. We sometimes also use helicopters to fly to the sites. This saves time and energy, which is especially valuable in a melting situation and on remote sites. The downside is that helicopter transport is expensive and that it requires special permits for many of the sites, as they are located in national parks. There is also the dilemma of using fossil fuels in our work to combat one of the consequences of climate change, mainly caused by the use of fossil fuels. Weather changes quickly in the high mountains. We need to be prepared for all kinds of conditions, including strong wind and snow blizzards. We mostly use Everest-rated Fox Explorer tents from RedFox for the crew, and they have proved their value on several occasions. We try to have one tent each, but sometimes we need to share tents. On longer stays, we also have a larger mess tent, where we can get together for food and talk in the morning and evening – or even during the day, when snowfall stops the survey. Then we just have to put the kettle on and wait. 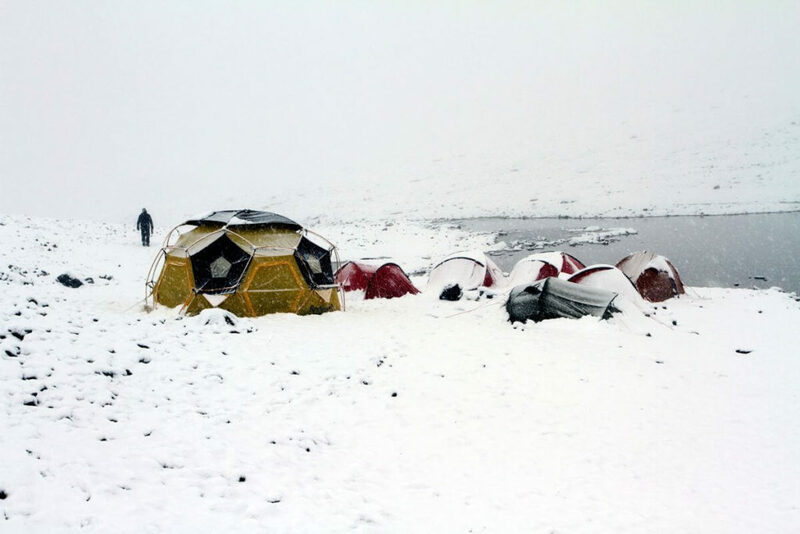 The Lendbreen basecamp during a snow blizzard in August 2013. Photo: Oppland County Council. The project has inflatable sleeping mats, specially designed for rough conditions. This allows us to camp on un-even terrain, such as scree. This is very helpful, because it makes it possible to place the camps high, very close to the ice, where flat ground is not available. Sleeping bags for winter conditions are necessary, as temperatures may drop as low as -10 C (14 F) during the night, especially on calm and cloud-free days. 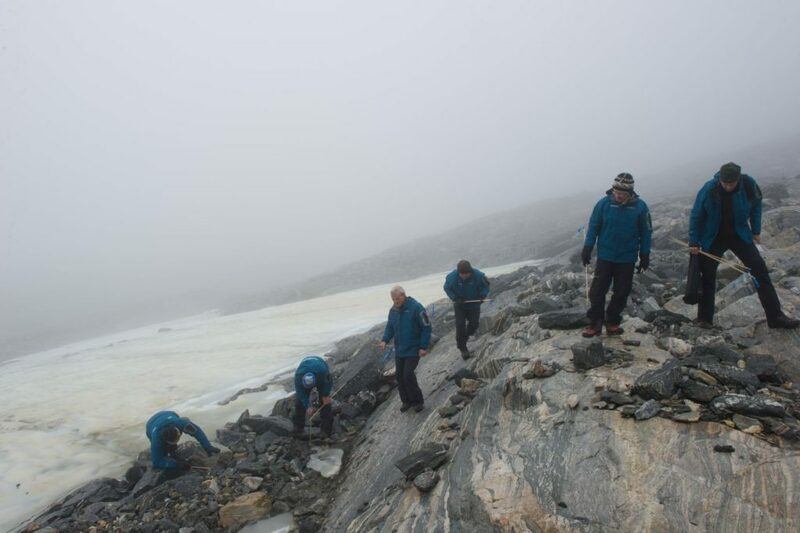 The crewmembers also need to bring their personal mountain gear, such as shell jacket and trousers, woolen clothing and mountain boots with extra protection against the sharp stones. When we have transport in and out, we can bring along items for more comfort, such as camping chairs for the mess tent. We work very long days in the field, and a little comfort is always welcome, even if it is just sitting in a chair instead of on a rock. Food is very important during longer stays in the high mountains. It is vital to eat and drink enough, even when tired and cold. When we have helicopter or horse transport to the site, we have the possibility to bring fresh food. We use the snow as a cooler, and it will keep the food fresh for the first week or so. When we have to walk in and carry the food ourselves, we rely on freeze-dried food, also known as colloquially as “inflatable” foods. 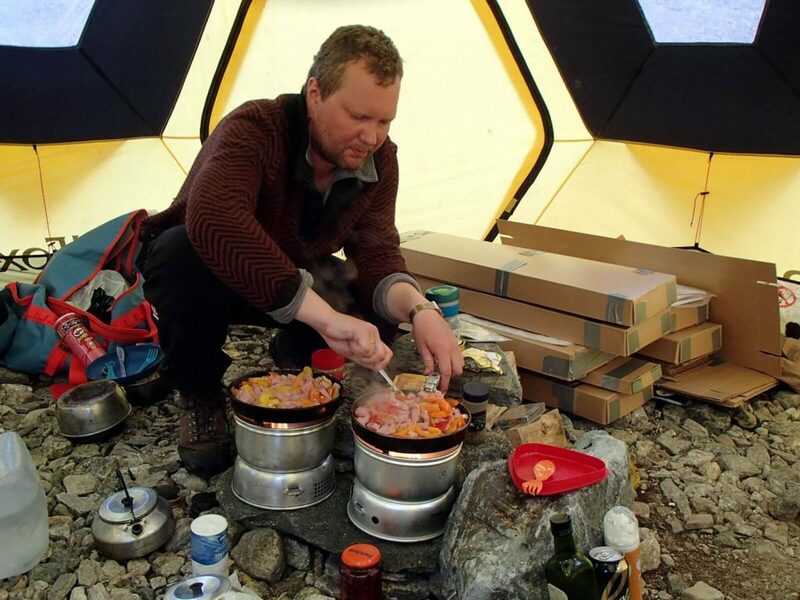 Runar Leifsson preparing dinner in the mess tent. Photo: Espen Finstad, Oppland County Council. We use gas/spirits-cookers for preparing the meals. We also have a heavier multifuel double cooker, which we use when we have a large team and transport in and out. We normally drink the water available on the site without boiling or purifying it. So far, this has worked out OK. However, recent studies show that ancient microbes and viruses survive inside the ice (read here), so we are considering starting to boil the water. This would require bringing a lot more fuel to the sites. How we survey the sites depend on what kind of site it is and the available time. On big sites, surveys can cover large areas, and it is important that the work be done systematically. Otherwise, areas may be left un-inspected and finds may be missed. The standard way of doing this is starting at the edge of the ice, and walking along it, with two meters between the individual surveyors. The person furthest away from the ice places large bamboo sticks with black duct tape flags at regular intervals. They mark the outer perimeter of the survey. Finds are marked using smaller sticks with a blue tape flag. When we reach the farther end of the survey area, we turn back and use the line of large bamboos sticks as the inner perimeter of the “return” survey. When we reach one of the large bamboo sticks, the innermost surveyor passes the stick along the line and the outermost surveyor places it c. 1 m outside his survey line. In this way, total area coverage is secured even if survey lines are not straight. Systematic survey along the upper edge of the Lendbreen ice patch in 2011. Photo: Johan Wildhagen/Palookaville. Once a few finds have been discovered and marked, two members of the survey team separate into a finds collecting team. They photograph the finds, measure their location, and collect and pack the individual artefacts. Sometimes, it is necessary to remove stones on the find spot, as parts of the artefacts may have slipped further down into the scree. This is typically the case with arrowheads. If we are on a day-trip to a newly reported or a potential site, we will normally just survey the areas closest to the ice, as there is no time for a more extensive survey. If there are only a few finds, we will collect them immediately while at the site, using only a small handheld GPS for mapping. If there are many finds, we only sample the finds and place an ID-marker where finds have been collected. The reason for this is that handheld GPS-devices are not very precise (+- 5 m). If we come back and do a proper systematic survey with a high precision GPS, we can measure previously collected finds with the same precision, allowing them to be placed on the same site maps. We normally do not take the high-precision GPS on day trips, as it is quite heavy. We prefer to travel light due to the many height meters covered during the day. When it is a melting year, we will return to sites that have already seen survey and finds collecting. In those cases, we only monitor areas newly exposed by melting ice. This is normally in front of the ice. Sometimes we also inspect the surface of the ice, when black ice (dark old ice) is exposed. If we are lucky, we can catch the artefacts as they are melting out of the surface of the ice. 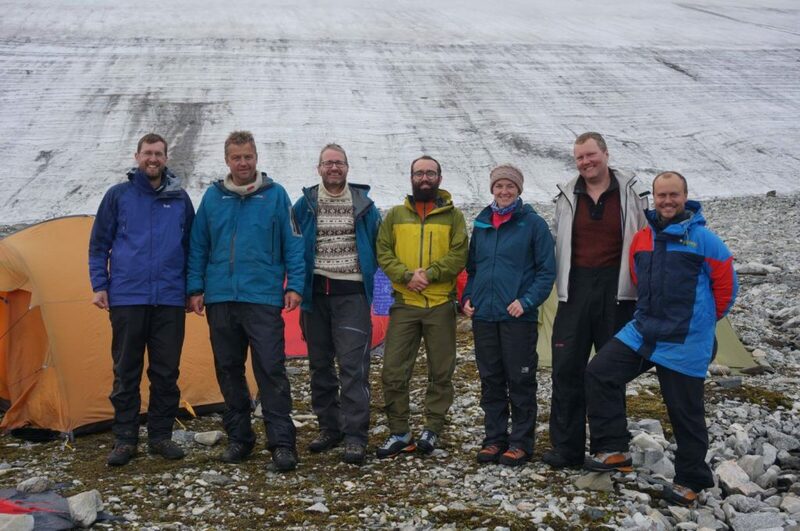 Participants on the glacier archaeology fieldwork in Oppland 2014. Photo: Oppland County Council. Working at the sites is not without hazards and we place a lot of emphasis on safety during fieldwork. Generally, we try to avoid potentially dangerous situations. We do not walk on the ice without crampons. We try to be careful in the scree, especially when it is steep. When the weather is bad, we stay in the camp. In 2012, we had two tents collapse on us during heavy winds at the Lendbreen ice patch, but our RedFox tents kept us safe, until the wind died down. However, with all this in mind: When the weather is nice, there is no better place to be an archaeologist than in the high mountains, searching for the secrets of the ice!